Old Ridgefield: Whoooo is there? Interested in riding around in the middle of the night, emitting strange sounds in the woods and fields? If so, Connecticut wants you. Concerned about the future of owls in the state, the Department of Environmental Protection has begun surveys to get a sense of their numbers, distribution, habitat, and habits in general. 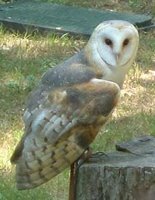 The problem with owls, of course, is that they are mostly nocturnal and are hard to see, so relatively little is known about them. Volunteer surveyors hit the road at midnight with special sound equipment that broadcasts the calls of Barred, Northern Saw-Whet, Great Horned, Eastern Screech, and Barn Owls. They play the calls and hope for responses. This year, teams traversed 13 routes with 130 survey points, and got responses at 30 locations. They found more than 30 birds – but no Barn Owls like the one above. Perhaps like the buildings they are named for, Barn Owls are disappearing, too. If you don’t mind night work and would like to help find whooooo’s around Connecticut, call Shannon Kearney-McGee, 860-675-8130, to volunteer for the 2007 owl survey.